There is a built-in scheduled job type that allows you to iterate over content defined by a CQL query, and do something with each hit. It is not advisable to use this on Data Center at the moment, as currently it will run on multiple cluster nodes. There is a specialised case of a scheduled job, where the results of a CQL query are passed to the code you provide. It saves you having to write the code to execute the query, and set the impersonation context. Depending on your query, the type of content in the above example will be either a Page, an Attachment, a BlogPost, or a Comment etc. However, it will always be a ContentEntityObject. If you only want to do something with pages, then use a query that only selects pages, eg space = ds and type = page. Alternatively, you can use instanceof in your script to do different things depending on the type of content. You should specify a user that has permission to see the content that you want. Your service code is automatically wrapped into a transaction template, but you should take care your service doesn’t not run for very long, unless it’s at a quiet time, e.g. the weekend. As a worked example, we’ll add a label pages that haven’t been modified for one month in a particular space. You may do this if you need to ensure that content is kept current, although this solution is deliberately over-simplistic. The query here selects pages (and only pages, not attachments, blog posts, comments etc) in the demonstration space that have not been modified for over 4 weeks. Look at the examples and refer to the CQL documentatation if you need help. Note that the number of hits from the query is shown. You should be careful that you don’t inadvertently more content than you intended to. The user to run the query as is also shown highlighted. Clicking Run now will run the service right now, so you can test (on a development instance ideally). The content of the file in the screenshot is below - you can either copy it as an inline script, or put it on a file under a script root. Alternatively you may wish to add a comment to any page that has not been modified for over three months, and has had no comment in over three months. This is very similar to the example above so refer to that for any missing information. CQL does not support searching on months or years, so multiply the weeks value appropriately. Over time, the number of revisions for each page will grow. Do you really need versions that were created over two years ago? Given that Confluence stores the entire content for each revision (rather than deltas), this can dramatically increase your database storage requirements. You should specify a user that has permission to edit the pages you want to prune. Specifying an admin account does not necessarily mean all pages will be pruned. CQL respects permissions even against an admin account. This will irretrievably remove versions according to your rules. They cannot be restored without doing a full space or Confluence restore. Make sure you have tested on your staging instance. At the very least start with a CQL query that selects just test content. Start by writing CQL to select the content you are interested in. See the provided examples to select only content from particular spaces etc. It’s possible to have a general configuration for all spaces, for example, keep all versions made within the last three months and a minimum of three, but more restrictive settings for certain spaces. You would do this simply by setting up two scheduled jobs. This current only works for blog posts and pages, support for atttachments will be delivered soon. The most recent version will never be deleted. 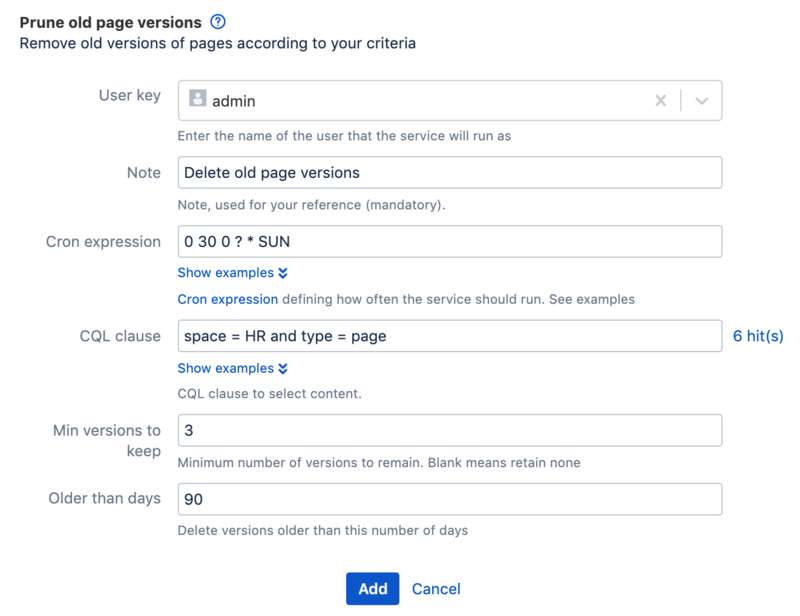 This script will check the pages and their descendants returned from the CQL clause provided to determine if there are any inactive pages. If any inactive pages were found a short report will be generated and emailed to all the users in the specified group. An inactive page is defined as a page of a specified age where all descendants are also the same age or older. Adding a comment to a page will flag it as active. Start by writing CQL to select the pages you are interested in. See the provided examples on the CQL field in the script to select only pages from particular spaces etc. The job could potentially take a while to complete if casting a large net with your CQL clause. This job will only operate on pages. The following image shows a timed archival job which will run as the Admin user each Sunday morning just after midnight. The CQL clause will find all pages in space with space key 'AN' which were last modified over 2 years ago.